It was not until I had reached a mature age that I experienced the amazing and pure love a dog can give. I suspect this unconditional form of love will never be extended to me again unless a dog offers it. This dog, named Rosie, was an unexpected gift into my life. We had little warning of how important she would become to us. My new husband and I, had moved to a new location on the big Island of Hawai'i and he had taken on a new client with two separate properties to maintain. Upon working at this clients up mountain cabin, he discovered an older dog there that was not the clients. Upon inquiring it was discovered that a sad and sordid tale of abuse and neglect was this poor aging dogs history. As a puppy the original owners of this cabin had the beginnings of a wonderful life. An off grid log cabin with diversified land, on a mountain side of the big Island of Hawai'i, with youth, love and a young daughter. They had gardens and chickens and decided a dog would compliment their lives. So Rosie the chubby puppy was founded by the wayside in a cardboard box. It seems that the mother and daughter loved her and their time together was joyous. Then a darkness crept in. For whatever reasons the husband became troubled. Anger and then abuse followed him home. Rosie was fearful of loud noises, work style boots, sticks or rod like objects, certain curse words and the smell of alcohol. These became seared into her emotional psyche and all the attempts at love and care could not erase that abuse. When these people and their life imploded, Rosie was abandoned on the property, alone, confused and broken. The client my husband contracted with was renting this cabin and as amazing as it sounds, poor Rosie came with it as part of the property. He had several dogs of his own already and a stern, paramilitary approach to training dogs that was not going to work or help Rosie to heal. She was now to be neglected and pushed to the bottom of the other dogs order and had to fend for herself with little spirit to achieve. I loved her and waited only a day to ask of my husband would he like to bring her home? 'dog-napping' was another concern so our final step was to inquire of the client. ​​He was more than happy to say yes and one day the truck pulled into our driveway, the tailgate opened and out of the dark came a shy and scared Rosie. I called her name and she was so happy. She was given a bath, dinner bowls, a pile of toys and her own bed. It all awaited her arrival. awoken to her new life with an unbounded spirit. This spirit of hers grew inside her and us and she became a chubby old dog with a real family. We gave her the ending of life story she deserved and parents tell their children about in fairy tales. At the age of fourteen, our poor old Rosie passed on. Years of fear and physical abuse, sleeping on a soggy piece of foam outside in the high mountain air had set arthritis and joint problems deep and though she gave us all her love, time took her physical being and freed her soul and spirit to the eternal. MONEY ...and we will be asking for your assistance. 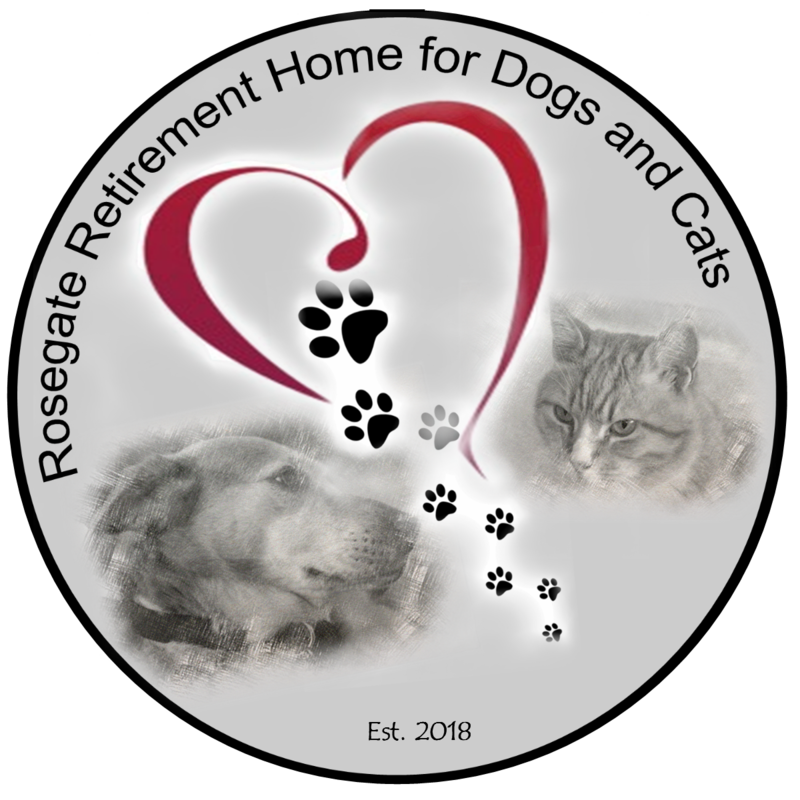 ​After taking care of our senior cat Tommy with Squamous Cell Carcinoma we've decided to add cats to the dream of Rosegate as well. We now call it, Rosegate Retirement Home for Dogs and Cats. Our lives have always had either a dog, cat or both sharing with us. If we can achieve our dream for dogs then we can easily add cats too. If we can do more we will and turn no senior animal away. Please Donate Today! If we build it together, we will save more lives!